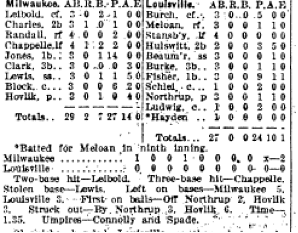 One hundred years ago—on August 20, 1912—Milwaukee fans got to see a rare feat, a no-hitter. Even rarer, in theory impossible today, was that it was thrown by a spitball pitcher. 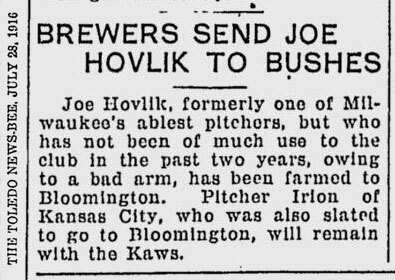 In January 1912 new Brewer manager Hugh Duffy secured the top-notch pitcher that he had been after for some time, spitballer Joe Hovlik. The big right hander had been born on August 16, 1884, in Austria-Hungary. It was said as a boy he practiced pitching by throwing at a mark on his father's barn on the old home in Iowa. "Feeling that he had progressed, he hired two different rubes to catch him, and broke both their hands with the spitball." He went back to throwing at the barn. 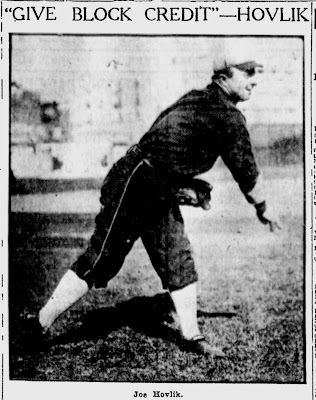 Joe had pitched in the Three-I League starting in 1908, and from 1909 to 1911 won 46 games and only losing 30 with Peoria. Hovlik appeared in a few games with the Washington Nationals in 1909 and 1910, before Duffy picked him up for the White Sox (the team he was managing at the time) in the middle of the 1911 season from Peoria. Hovlik's big weakness was his inability to control his sweeping spitball. But Duffy thought once the "Giant Bohemian" learned to control this he would become another Ed Walsh. Duffy offered the White Sox $2,000, and manager Jimmy Callahan agreed, provided Milwaukee would give the Sox a chance to recall the pitcher for the same price. Duffy refused to make a deal with any string attached, and upped his offer to $2,500. Callahan wanted $3,000. Finally on January 25 the clubs split the difference and Hovlik was sold to the Brewers for $2,750. Within a week Joe sent in his signed contract. Hovlik did not do as well in Milwaukee as everyone had hoped, but he was not pitching as bad as his mid-July 5 and 9 record indicted. In 118 innings he had given up only 109 hits, accounting for 58 runs. One issue he had was a painful boil on his arm, which needed to be lanced. To show Hovlik was highly thought of, it was reported that Clark Griffith of the Washington American League club was after him. Duffy said he knew nothing of this, and if true he would not let Hovlik go, as the spitballer was doing too good a job with his Brewers. Joe began complaining early in the game about there being something on the ball. We did not take it seriously until along in the fifth inning, when after using his spitter all through the inning he was so sick when he came back to the bench that we thought he would have to retire. All of the players on the Toledo bench were watching our bench and when they saw that Joe was sick they all had broad smiles on their faces. However, Joe went back in the next inning, but in the eighth when they began hitting him he was taken ill again. Of course, we might have lost any way, but Joe's condition after the game showed clearly that something was wrong. Hovlik also took sick on the train ride home, having several vomiting fits. On August 18 the Brewers had a 60 and 65 record, and Joe Hovlik was 9 and 13. Then the pride Oxford Junction, Iowa, had his moment in the sun. Hovlik's mighty arm never uncoiled such magical twisters and such wide breaking snapping spitters as it did yesterday. His great spitball, the equal of Ed Walsh's when it is working right, broke north, east, south, west and to all other points and corners of the compass. It had the enemy standing on their eyebrow, their heads and ears and so effective was his support that but one man reached second during the record breaking contest. Joe was a trifle wobbly early in the game when he passed three men, but after the fifth when he had a no-hit performance in sight, the ball came true to the mark round after round. Up to the eighth the crowd sat back in its seats hoping against hope to see a no-hit contest but fearful lest they break the charm by rooting for such a possibility. They could contain their enthusiasm no longer however, and as Fisher, Ludwig and Northrup went down in a row in the eighth they shook the stands with their wild yells. Burch, the first man up, buzzed a terrific shot down the third base line. The crowd let out a funeral groan for it looked like a safe hit but Clark was after the ball like a shot. He blocked it with his gloved hand, made a rapid recovery and by a beautiful throw nipped the mercury heeled runner at first. Hayden, batting for Molly McLean, who had been uncut for Joe all afternoon, he trotted out to smash the record, but Joe working like a Trojan put all his stuff on the ball, and Hayden fanned. The crowd could contain itself no longer and the bugs squirmed and tossed about on their seats like so many packages of frayed nerves. 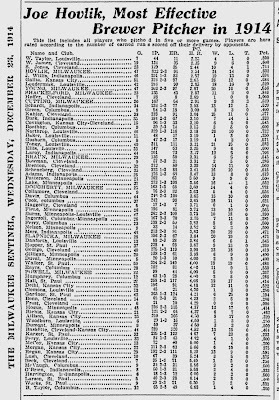 Stansbury was the only batter between Joe and a record breaking performance, possibly the feat of a life time. But he was the coolest man in the yard, cooler even than his pals who were straining every nerve and muscle for a no-hit game. Stansbury, one of the A.A. sluggers was up. He let one cut the plate. The next broke beautifully, but the swatter hit the ball and it went scampering at Lewis. The Cornell collegian wrapped his mitts about the ball, tossed it to Jones, and Joe was the biggest guy in town. The crowd gave the big fellow an ovation as he trotted from the field, and the nuts in the quarter seats jumped over the screen to show their enthusiasm by patting the big Iowan in the short ribs. Hovlik, a weak hitter, collected a rare single in the game. After the game he was modest and gracious. When a Louisville player congratulated him on his performance, he answered "Sure, I knew I would get one some day." The Colonel replied that Joe had good stuff in the game. "Oh, you were talking about pitching," said Joe, "I thought you meant that hit I made." In a more serious mood Hovlik said: "Don't forget Jimmy Block. Jimmy deserves just as much of the credit as I do. The way he sized up the batters had as much to do with it as my spitter. Was I nervous? Well, at the start of the ninth inning I felt a little shaky. But after the first man went down I knew they wouldn't hit me." It was the second no-hitter of the 1912 American Association season—the first was by Bill Lelivelt of Minneapolis a few weeks earlier. It was also the second no-hitter ever thrown at Athletic Park, Cliff Curtis having done it against Indianapolis five years prior. The no-hitter was the first game of a doubleheader. In the second game Cy Slapnicka tossed a six-hitter, winning another shut out, 7 to 0. 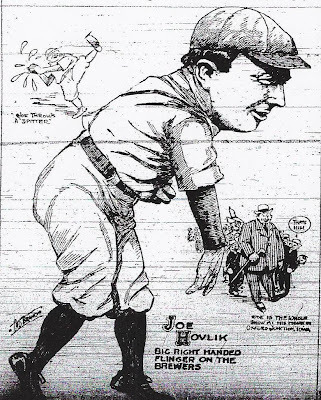 Joe Hovlik ended the 1912 season with 12 wins and 15 losses. In 243 and 2/3 innings he gave up 203 hits and allowed 116 runs. He struck out 147 batters, while walking 78. The Oxford Junction Moose stayed with the Brewers another four years, winning 11 and losing 9 in 1913, before having his career season in 1914, posing a 24 and 14 record. Injured in 1915, he was only 1 and 4. 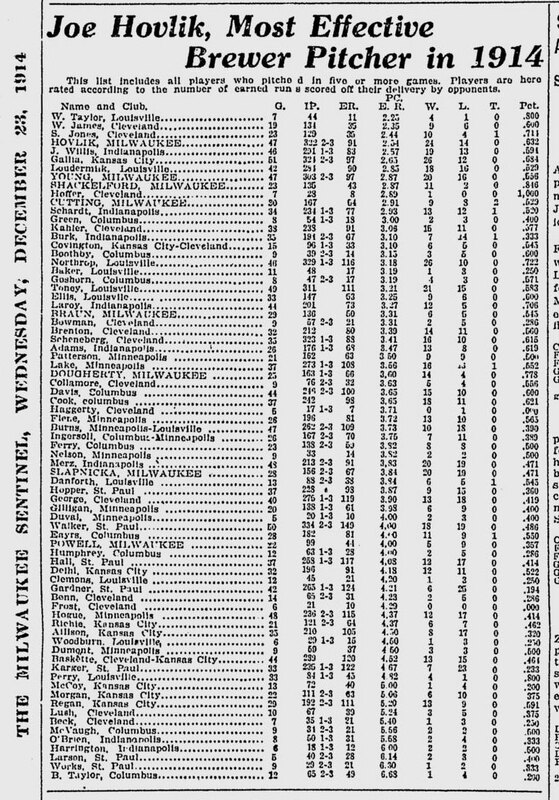 Joe really fell off in 1916, winning 1 and losing 12 before the Brewers released him.